Many new products are doomed from the beginning because they are not launched successfully to the sales force. Don’t Let Your Next Product Launch Fail from Sales Momentum shares industry best practices to help B2B companies successfully launch new products to the market. "For better results train the sales force and then launch your new product rather then launch and then train." Companies launch a dazzling array of new products every year. Some are designed to be significant revenue producers or game changers. A few are “bet the company” entries into the market. All too often, new product sales disappoint. Some may blame the market, the timing or even the product itself. Alternatively, new products sales often fall flat because the investment in improving the sales team’s ability to sell the new product is inadequate. Why? Beyond product knowledge, successful salespeople must craft a sales strategy for the new product. A common pitfall when selling a new product is failing to acknowledge that it almost always involves new selling challenges. “When sales reps are left on their own to figure out how to sell new products, the sales results are often disappointing. But there’s one strong, underlying factor that “encourages” salespeople to sell a new product – they have developed the knowledge and skills to know how to do it,” says Dr. Janet Spirer, co-founder of Sales Momentum. According to Richard Ruff, co-founder of Sales Momentum, “When launching a new product the goal is not time-to-market; it’s time-to-market share. This means the sales training investment should be made and sales training implemented before the new product is launched.” The more innovative the product and more extensive the training, the more important it is to start the skill development before the launch. 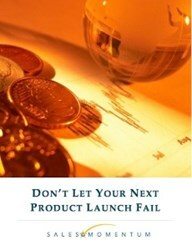 The free white paper, Don’t Let Your Next Product Launch Fail is available as a pdf file. About Sales Momentum: For more than 30 years Dr. Richard Ruff and Dr. Janet Spirer – the founders of Sales Momentum – have worked with the Fortune 1000 to design and develop sales training programs that make a difference. By working with companies – such as UPS, Smith & Nephew, Textron, the Center for Creative Leadership, and Robbins & Myers – they have learned that today’s standard for a great sales force significantly differs from yesterday’s picture. Janet and Richard co-authored Mastering Major Account Selling and Parlez-Vous Business. They also publish the sales blog - Sales Training Connection. Richard co-authoredManaging Major Account Selling and Getting Partnering Right. The books are available here.